From Disneynature the studio that brought you Earth, Oceans, and African Cats, comes Chimpanzee– a remarkable story of individual triumph and family bonds. Journey deep into the African forest and meet Oscar, an adorable young chimp with an entertaining approach to life. The world is a playground for little Oscar and his fellow young chimps who love creating mayhem. His playful curiosity and zest for discovery showcase the intelligence and ingenuity of some of the most extraordinary personalities in the animal kingdom. Stunning hi-definition images bring you up close and personal as Oscar and his family navigate the complex territory of the forest. It’s an inspiring and life-changing adventure that overflows with courage and charm. And it will capture your heart. “See Chimpanzee, Save Chimpanzees”– This feature details the “See Chimpanzee, Save Chimpanzees” conservation program and how for every copy of the film purchased until August 27, 2012, Disneynature will make a donation to JGI to protect chimpanzees today and tomorrow. The feature also includes an interview with Dr. Jane Goodall, DBE, founder of the Jane Goodall Institute and UN Messenger of Peace. Disney’s Friends for Change– This feature highlights Disney’s Friends for Change, a program that showcases steps that kids and families can take to make a positive on the world and the people and animals that live there. Disney’s Conservation Legacy– This feature provides a look at the conservation efforts that Disney sponsors around the world. On Location: The Making of Chimpanzee is a series of exciting short features that delve further into the incredible lengths of filmmakers went to tell the story of Oscar and his chimpanzee family. 30 Years in the Making- The story of the team of researchers who have been observing chimpanzees in the Ivory Coast for 30 years. The Heart of the Chimpanzee– A behind-the-scenes look at how and why the film was made. Piece of the Puzzle– A cameraman’s two-hour daily trek through the forest to get to the chimpanzees. Don’t Blame the Tool– An observation of the chimpanzee’s daily lives and how they use rocks as tools to prepare their food. Scar’s Army– An inside look at the struggles between the film’s two rival chimpanzee groups who share the same forest home. Camp Invaders– A featurette on all the creepy, crawly creatures found at the filmmakers’ forest camp. Forest of Bees– A feature detailing how the crew spent two days wading through a sea of bees that inhabited their filming location in order to capture 20 seconds of footage. “Rise” Music Video– A music video featuring Hollywood Records recording artists McClain Sisters who wrote and performed the inspirational song that plays during the film’s end credits. Behind the Scenes of “Rise”– An inside look at McClain Sisters music video shoot. I’ve been anticipating the release of Chimpanzee for months. 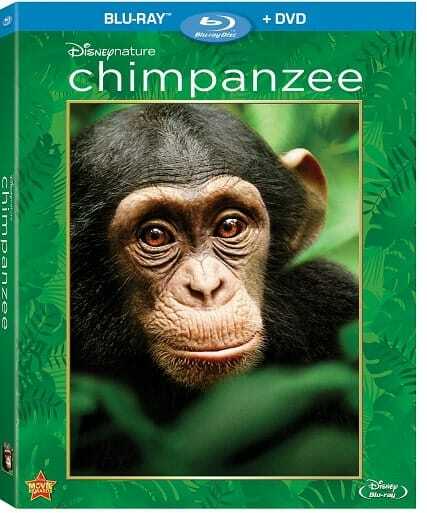 I’ve got a collection of all the previous Disneynature films and couldn’t wait to get my hands on Chimpanzee. If you haven’t watched a Disneynature film yet, be prepared to be blown away. They are wonderful! I sat down the other night while John slept on the couch to watch Chimpanzee. Immediately, I was captured by the beauty of the African jungle landscape, but most of all by the world of chimpanzees, which up until this point have been a mystery to me. I’ve seen chimps in movies and at the zoo, but I’ve never watched a documentary about them or learned how they lived. What I was about to see surprised me. I woke John up a few times from exclaiming, “Wow” and “No Way”. In the film, we are introduced to a young chimpanzee, Oscar and his mother, Aisha. Watching Aisha care for Oscar, I could see how similar chimps are to human moms. They are protective of their young, nurturing and want to teach independence. When danger was close, I was amazed at Aisha’s response. She scooped up little Oscar and took off. I could see as clear as day her mothering instincts take over. I was also shocked to see just how smart chimpanzees are. In the nearby nutgrove, I watched as they used rocks to break open shells of various nuts to eat. The shells are extremely hard to open and there’s a special technique the chimps have to master in order to open the shell. It was adorable to watch little Oscar try and open his nuts with a tree branch. He tried and tried- it was so cute. The older chimps had the shell cracked in one whack and made it look easy! Chimpanzees are also meat eaters and I watched them work as a team to catch a monkey in the trees for their supper. It was truly amazing to see how each member had a specific role to play for the attack to be a success. The best part of Chimpanzee though, was watching the bond between Freddie (the alpha male) and little Oscar grow. Males are not normally nurturing like females, but I think Freddie sensed that Oscar needed him. I can’t say too much here without giving away what happens. Just take my advice and bring some tissues. I was really touched! There were also some tense moments in Chimpanzee. Freddie’s group went over to another tribe’s territory in search of a fruit tree to eat. While there and enjoying their meal, the other tribe snuck up on them and sent them running! Then awhile later, Scar’s Army (the other chimpanzee tribe), launched an attack on Freddie’s tribe (where little Oscar and his mom are). Chimpanzee is a must-watch film that the whole family will enjoy. I can’t wait for my girls to see it when they return from their vacation at their grandparents! From today through August 27, 2012, Disneynature will contribute $0.50 to the Jane Goodall Institute for the Disneynature Tchimpounga Nature Reserve Project for each Blu-ray DVD Combo Pack and Digital purchase made! Buy Chimpanzee & support this worthy cause! Connect with Chimpanzee on Facebook, Twitter and on the web. I loved this movie, because like you I saw humanity in everything the chimps did. Their community, intelligence, and ability to form strong relationships from nothing are stirring examples of the similarities between animals and humans. I got a bit of ribbing today from my co-workers at Dish when I mentioned how this movie brought me to tears when I saw it in theatres. To counter I rented it from Blockbuster @Home, and I am having some of them come over to watch it. I got the Blue Ray so it should just blow them away with the beautiful HD, even if their hearts are too hard to cry in front of people. Revenge will be sweet! I would love to see this! I have known for many years that Chimpanzee’s are smart, my daughter has been researching them for quite sometime for her school. This look like a great family movie! Great review!